Swami Gitanandaji was born in Arial village of Dhaka district (now in Bangladesh) on 17 April 1924. An initiated disciple of Swami Virajanandaji Maharaj, he joined the Order at Chennai Math in 1946, and had Sannyasa from Swami Shankaranandaji Maharaj in 1956. Besides his joining centre, he served at the Headquarters and Kanpur centre as an assistant and Ranchi Sanatorium, Varanasi Home of Service and Kankurgachhi centres as head. He also served Swami Virajanandaji Maharaj as a personal attendant, and was a Secretary to Revered Shankaranandaji Maharaj for some time. In April 1973, he was appointed a Trustee of Ramakrishna Math and a Member of the Governing Body of Ramakrishna Mission. In June 1974, he was elected an Assistant Secretary of the twin organizations, and in April 1975, he was elected Treasurer of the Math and Mission. In 1985 he was re-elected an Assistant Secretary in which capacity he served for a decade. 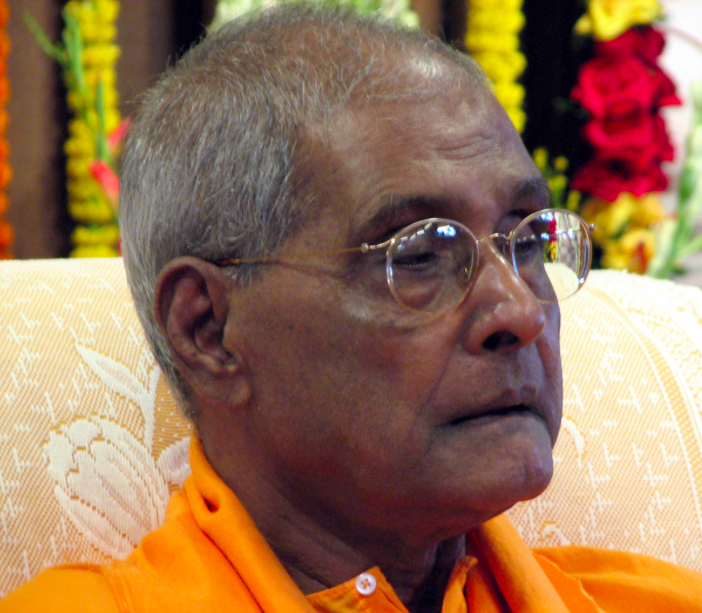 He was elected a Vice-President of the Ramakrishna Order in April 2003, which office he held till the end. During his spiritual ministry, he blessed many devotees with mantra diksha (spiritual initiation) in different parts of the country. He has two Bengali books to his credit: Sri Ramer Anudhyan (Contemplation on Lord Rama) and Bhagavat Katha (Selections from the Bhagavata). The news of mahasamadhi of Most Revered Gitanandaji reached me in the morning of 14th March when I opened my laptop to check my emails. Bowing to him mentally, I re-read the news. Immediately my mind was occupied with nostalgia about my brief joyful association with this holy monk. Widely known as ‘jaapak sadhu’, he was a veritable inspirer in our spiritual life. The very first time I met him in Belur Math at the start of my Training Centre session, he lovingly enquired about my stay at Kanpur. He was once working as Assistant Secretary in the Kanpur ashrama. I told him that the shrine in that ashram was exceedingly beautiful. He then went on telling me how he would love to do his sadhana in that shrine where he found Master ‘living’. Due to perhaps ‘Kanpur-connect’ there was no bar even if I go and sit at his office just to exchange a few loving words. He was one of the Assistant Secretaries then. I was able to go to his room too whenever I was pleased to. In those out of office hours, I had found him in his room sitting straight, doing japa with his mala in his hand. The screech of the door opening would make him realise that someone was in and slowly as if he was awakened, he would so welcomingly invite me to take my seat. There was not a single time I found any expression of “you fellow disturbed me”! Two times in my association I had seen his tears flowing down his cheeks. The first time I was stunned at his shedding tears. I innocently enquired of him whether he was finding any physical discomfort. He affirmed no and said that the only discomfort was that he could not do ‘enough’ japa! The second time was a memorable travel with him in the same car from Jamshedpur to Ranchi Sanatorium. I should mention here that he was once the Head of Ranchi Sanatorium and my being Head there somehow brought me closer to him as I would always convey the pranams of the old employees especially of the tribal ones for whom he had great love. In the car of course his Secretary was also present. As I knew that Revered Maharaj was fond of stories of Shri Ram, I picked up the subject of his then recently released Bengali book on Shri Ram. I did read it and I could start the discussion on the relationship that Shri Hanuman had with Shri Ram. And in a childish way I asked him whether he knew that once Shri Ram was about to ‘kill’ his greatest devotee Shri Hanuman. I could see his face on the front small mirror of the car instantly changing pensive. “Tell me, tell me” he quickly responded with perhaps some sort of anguish. He exclaimed loudly how Shri Ram could even think of annihilating his own servant-devotee Shri Hanuman! Lo! It was impossible! Continuing the story I built up the climax scene when Shri Ram had strung the brahmaastra onto his bow and that he was just ready to aim on his ‘dearest’ target, tears swelled in Revered Maharaj’s eyes and he could not stop sobbing! His Secretary and self were just amazed at the emotional involvement of Revered Maharaj had while listening to the story where he could not ‘accept’ the fact that Shri Ram would kill Shri Hanuman. Of course the story as usual had a happy ending with Shri Hanuman being embraced by his Lord Shri Ram. He was greatly relieved at the turn of the events in that story and he was much appreciative of this wonderful legend. One more thing that touched my heart about him was his loving nature towards tribals. At Ranchi Sanatorium he would sit on a bench kept outside in the entrance verandah. Next to him would be our Durga maharaj. But both would remain silent and would not have any conversation for a long time. While Durga maharaj would be immersed in his loving prayers, Revered Gitanandaji would continue in his japa in spite of the cushioned sofa set kept apart for the ‘Vice-President’ in the lounge. If pointed out by any monk, he would assert that he was happy to sit in a bench. Then quickly he would ask that monk whether he was keen in ‘his’ happiness! The monk had no other option but to allow his own way. Besides the treatment facilities for the TB patients, the Sanatorium had by then expanded into many types of rural development activities wherein the tribal – old men and women and also children – getting direct benefits. I took him to some of the nearby villages where he was extremely happy to see those old people whom he knew personally. He was charmed at the welfare measures that go directly to the service of the poor. He encouraged all of us to perform these welfare activities thinking that Master and Mother are being served. Indeed he was always an inspirer to the monks and brahmacharins. Here is a slideshow of four pictures of Swami Gitanandaji when he visited Ramakrishna Mission TB Sanatorium on 19th September 2004. Next Post: Ram Ram ! Trust that our Revered Maharaji is in good health. It was sad to hear the news about Revered Swami Gitanandaji Maharaji who was an epitome of love and compassion. It was a blessing indeed to have received darshan from Revered Maharaji at Belur Math some time ago. Revered Maharaji‘s humble and loving nature touched the hearts of so many devotees and the holy vibration that Maharaji emanated will linger on forever! This post was Immensely Inspiring! You are right! Those devotees who came into contact with this great sadhu never forgot him. I saw many old veterans in the Dungri and other villages near our TB Sanatorium would always joyously take his name and recount their pleasant interaction with him. See how well behaved character can make a sweet relation! Thank you Maharaj for this beautiful article on Revered Gitanandaji Maharaj. My appreciation for your kind words! Please convey my respectful pranam to Revered Muktirupanandaji. Hope he is keeping good health. Trust by His grace this finds you all hale and hearty. My hearty thanks for your appreciative words that are indeed blessings to me! Please take our pranam. Hope, you are in good health. We are really very happy of getting the article and news of great saint Revered Swami Gitananda Maharaj. We attended the special puja and Bhandara of Swami Gitananda Maharaj on 26th March, 2014 at New Delhi Ramakrishna Mission. So many devotees came and paid respects. Me too happy to know that by His grace you both could attend the special puja and bhandara at our Delhi Mission centre. Its all His grace. May Master’s blessings be with you! It is Thakur’s kripa that we received mantra from such a spiritual dynamo. Indeed I am glad to know that you and your husband were bestowed with mantra diksha by Revered Gitanandaji Maharaj. The very fact of his ascending to the Gurusthan – (the position of a spiritual preceptor) did not happen in a normal course. He refused to become a Vice-President until, he declared, he gets an aadesh – order – from Master Himself. And only after his obtaining the required ‘permission’ he agreed to become a Vice-President. So no wonder that he attained samadhi in his living time in the physical body. Ensure that as his disciples you both carry out the instructions of your Gurudeva with all your heart. May Master and Mother provide the support in your spiritual endeavour! Your Blog captures the attention of the readers immediately & leaves a blissful impression on them for a long time. It is speechless to me & I wonder how it feels like to those who are near you. You share your wonderful experiences in a remarkable way. Now the Ram Navami is approaching and you will be going to various sub-centres to inspire the devotees. Today I had my Talks in Phoenix Sub-centre. This month I have only 16 Talks! I got initiated from Gurudev in 2006. Couldn’t get much opportunity to know him from close. But whenever I have taken shelter in his lotus feet during any critical phase of my life, he showed me the path and held me high throughout. I recollected those memories as I read this article of yours. I can visualize the incidents that you have mentioned. Thank you Maharaj for such a wonderful divine journey. I am happy to know that you were initiated by this wonderful monk. It is the capacity to visualise the incidents that are studied can take our devotion to a higher level. Master always used to recommend the ‘chewing’ when one has completed his pilgrimage. Reading is also like going places where incidents happen. It is my earnest wish that your divine journey proceed toward your destination unhampered. May the blessings of Master be with you! Thank you so very much for sharing those wonderful incidents with all. Felt so very thrilled by reading your wonderful story with Revered Gitanandji Maharaj! I humbly bow to the great saint Revered Gitanandji Maharaj. Though we couldn’t have darshan of Swami Gitanandaji Maharaj, through your wonderful description we could mentally imagine the great saint and prostrate sashtang to Him! Please keep enlightening us through your wonderful stories. Jai Sri Ramakrishna and Divya Janani! The sentiments that you have expressed about the great saint Gitanandaji have gladdened my heart. I deeply appreciate your thankful words! Saints like Gitanandaji are rare. It is a pity that during their physical presence most of us are unable to grasp the import of their sayings and actions. I am yet to see a simpler sadhu than him. In Ranchi Sanatorium, when he was on a visit, I had very closely observed and served too. Once when he took out his shirt, I extended my arms to receive it and while I was taking by the other hand a hanger, he just grasped the shirt instantly away from my hand and put it on the mosquito net stumps over the bed. He leisurely turned towards me and in a sweet voice he said, “Look, as much you increase objects for comforts, so much your attachment will also grow. Learn to live with the bare minimal things. There is peace in that.” From the experience of life I find it true. Humble pranam to your lotus feet Maharaj! I know we are the one who crave for all these objects of comforts but not you! In a very simple and sweet way Swami Gitanandaji Maharaj is teaching to me and people like me. Blessed we are to come in contact with you and by getting blessings from you! Thank you very much for appreciating me Maharaj! Please check page 11 of Gitananda English.pdf, the book published by Belur Math after Maharaj‘s mahasamadhi. This ‘Ram-related incident’ is mentioned in toto. Very happy! Thank you very much for the reference! Yes, I did go through the English pdf version online and was pleasantly surprised to see the ‘Ram-related incident’ mentioned in that short booklet. Besides, the other two incidents also are included in that booklet brought out by Belur Math. Thanks to the Editor Swami of the 32-page booklet who thought that these incidents deserve publication! Went through the amazing article on Revered Maharaj. I was very lucky enough to get initiated by Him at Yogodyan Math, and was at His service for 6 years as a personal volunteer. Miss each of those ‘golden days’ gone by. My sastang pronam to You.